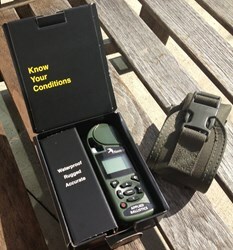 Weather Meter Carrying Cases for Kestrel wind meters are now available at KestrelMeters.com, the leading online retailer of Kestrel weather meters recently announced. Kestrel weather meters are portable, professional condition measuring devices that are often used in extreme environments, and the carrying cases are made specifically to help the meters survive anything. Hunters are preparing for the season, and these carrying cases are the perfect stocking stuffer for the outdoorsman in your family. The tactical MOLLE (Modular Lightweight Load-carrying Equipment) case for Kestrel meters were designed with the full featured Kestrel 4000 series in mind, but will fit any Kestrel unit perfectly. Kestrel sells top of the line wind meters and handheld weather meters that are designed to be easy to use, highly durable and portable. The company provides products for a wide range of professionals, including police, firefighters, sports coaches, farmers, HVAC techs and military personnel all over the world. For more information, please visit http://kestrelmeters.com.